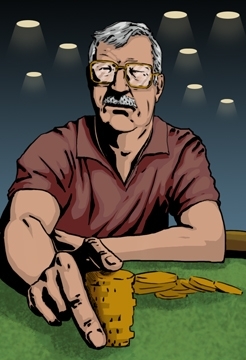 Poker Perambulation » Why Is Poker So Popular? Home > Commercial, Poker Basics	> Why Is Poker So Popular? When it comes to online casinos, there’s one game in particular that is always a favorite amongst punters: poker. So why is poker so popular? It is perhaps one of the most regularly portrayed forms of gambling in films and television programs. It has appeared in programs such as the popular show, The Sopranos series or films such as the classic Goodfellas. It has a reputation of being one of the most sociable games to play, usually associated with lads nights in featuring copious amounts of beers, crisps and lads only chats around a table whilst everyone places bets. Perhaps it is this cultural influences that make it one of the most popular games to play. Due to its popularity there are now several forms of poker that can be played, and all of these can be translated into online games. You can try them yourself just find the best online casino games in the UK at GamingClub.co.uk. The basics of poker means that it is a game of chance, but when you add an element of gambling, the game becomes much more high stakes and can rely on skill and psychology. It does take a lot of skill to perfect the game. For those who don’t know poker, it is a game that is played with a whole pack of cards. The cards are ranked from high to low, although all suits are equal. Each player is given a hand of five cards. The aim is to get a combination of cards in your hand that will beat your opponents, such as a Flush, Three of a Kind or Full House. Perhaps what makes the game so popular is the surprise element. The fact that the player is always having to guess what the other player has in their hand in order to perfect a combination. Either that, or the portrayal of it in our popular culture makes it a desirable game. There’s a new moving that (I think) came out yesterday called Runner Runner with Ben Afleck which I intend to see. Oops, I mean “movie” not moving. Need new typing fingers. I love the poker scene toward the end of the remake of Casino Royale.